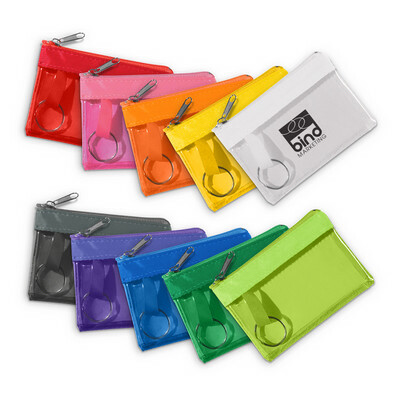 A handy ID holder complete with a zippered compartment, split ring for keys, a pocket on the reverse and a clip. A lead time of 10-15 working days applies to this product. Colours: Orange/Black, Red/Black, Lime Green/Black, Forest Green/Black, Light Blue/Black, Royal Blue/Black, Burgundy/Black, Purple/Black, Black/Orange, Black/Red, Black/Lime Green, Black/Forest Green, Black/Light Blue, Black/Royal Blue, Black. Dimension: W 114mm x H 82mm. Print Description: 51mm x 38mm (two colour max). Print Type: Screen Print. Packing: Loose packed. Less than minimum quantities are not available for this item. MOQ applies per colour on this item. 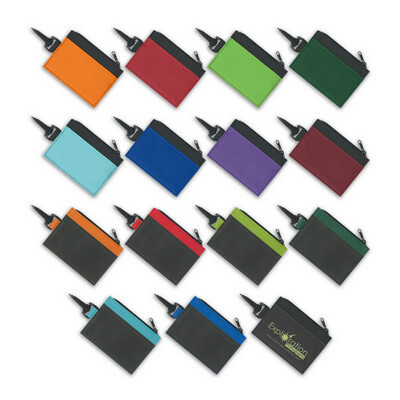 80 gsm non woven badge holder with a neck cord which has a breakaway safety clip. 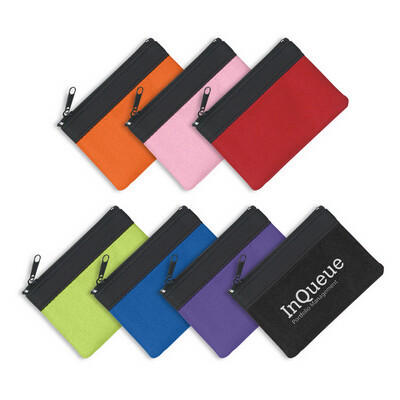 Has a clear 127 mm x 114 mm plastic badge window, a business card pocket and two pen loops. A lead time of 10-15 working days applies to this product. Colours: Red, Forest Green, Royal Blue, Black. Dimension: W 140mm x H 209mm. Print Description: 63mm x 25mm. Print Type: Screen Print. Packing: Loose packed. Less than minimum quantities are not available for this item. MOQ applies per colour on this item. PVC coin wallet with an internal split ring for keys. A lead time of 10-15 working days applies to this product. Colours: Frosted White/Yellow, Frosted White/Orange, Frosted White/Pink, Frosted White/Lime Green, Frosted White/Teal, Frosted White/Royal Blue, Frosted White/Purple. Dimension: W 114mm x H 76mm. Print Description: 51mm x 38mm (two colour max). Print Type: Pad Print. Packing: Loose packed. Less than minimum quantities are not available for this item. MOQ applies per colour on this item. 420D nylon badge holder with a neck cord which has a breakaway safety clip. Has a clear 101 mm x 76 mm plastic badge window, a business card pocket two pen loops and an internal compartment with a zip cloure. A lead time of 10 - 15 working days applies to this product. Colours: Yellow, Orange, Neon Pink, Red, Lime Green, Kelly Green, Khaki, Forest Green, Turquoise, Royal Blue, Navy, Burgundy, Purple, Black. Dimension: W 127mm x H 168mm. Print Description: Front - 76mm x 25mm (one colour). Print Type: Screen Print. Packing: Loose packed. Less than minimum quantities are not available for this item. MOQ applies per colour on this item. 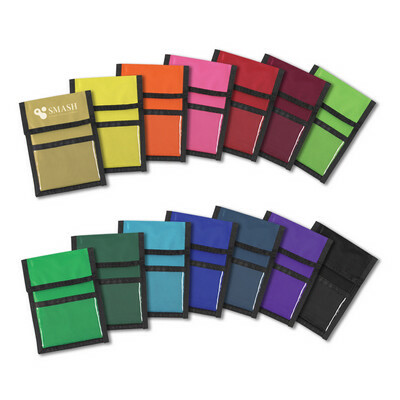 420D nylon badge holder with a wallet and a neck cord which has a breakaway safety clip. Has a clear 89 mm x 101 mm plastic badge window on the reverse and two zippered pockets on the front. A lead time of 10-15 working days applies to this product. Colours: Red, Royal Blue, Black. Dimension: W 101mm x H 127mm. Print Description: 51mm x 32mm (one colour). Print Type: Screen Print. Packing: Loose packed. Less than minimum quantities are not available for this item. MOQ applies per colour on this item. 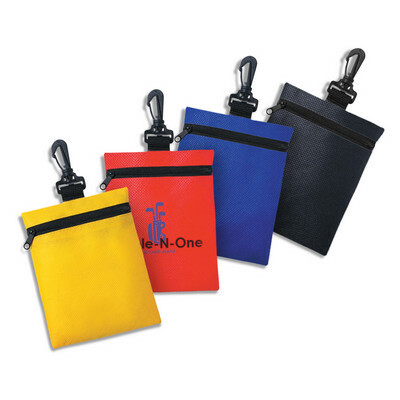 Handy clip on pouch manufactured from 80 gsm non woven material. Ideal for holding golf accessories, cash, earbuds, charging cables, a power bank etc. A lead time of 10-15 working days applies to this product. Colours: Yellow, Red, Royal Blue, Black. Dimension: W 120mm x H 152mm. Print Description: 76mm x 76mm. Print Type: Screen Print. Packing: Loose packed. Less than minimum quantities are not available for this item. MOQ applies per colour on this item. 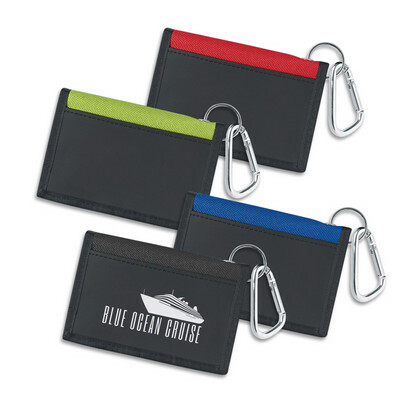 Coin wallet manufactured from and 600D polyester with an internal key ring and zip closure. A lead time of 10-15 working days applies to this product. Colours: Orange, Pink, Red, Lime Green, Royal Blue, Purple, Black. Dimension: W 108mm x H 76mm. Print Description: 76mm x 38mm. Print Type: Screen Print. Packing: Loose packed. Less than minimum quantities are not available for this item. MOQ applies per colour on this item. Folding wallet with a dome closure. 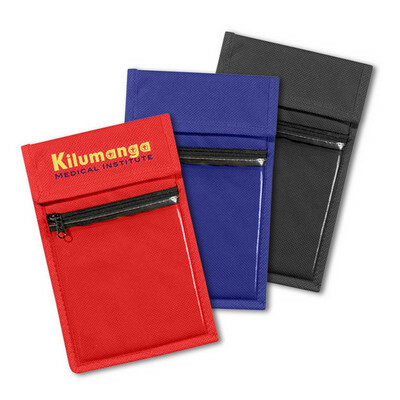 Has two internal pockets, a key ring and a zippered coin pouch. A lead time of 10-15 working days applies to this product. Colours: Red, Royal Blue, Black. Dimension: Folded: W 114mm x H 76mm. Print Description: 63mm x 51mm (one colour). Print Type: Screen Print. Packing: Loose packed. Less than minimum quantities are not available for this item. MOQ applies per colour on this item. Folding wallet with a Velcro closure and a carabiner. Has a clear internal ID window, two Khaki internal pockets one of which has a zip closure and an outside front pocket. A lead time of 10-15 working days applies to this product. Colours: Black/Red, Black Lime Green, Black/Blue, Black. Dimension: W 108mm x H 76mm. Print Description: 51mm x 38mm (two colour max). Print Type: Screen Print. Packing: Loose packed. Less than minimum quantities are not available for this item. MOQ applies per colour on this item. Translucent PVC coin wallet with an internal split ring for keys. A lead time of 10-15 working days applies to this product. Colours: Clear, Yellow, Orange, Pink, Red, Lime Green, Green, Blue, Purple, Charcoal. Dimension: W 114mm x H 76mm. Print Description: 51mm x 38mm (two colour max). Print Type: Pad Print. Packing: Loose packed. Less than minimum quantities are not available for this item. MOQ applies per colour on this item. 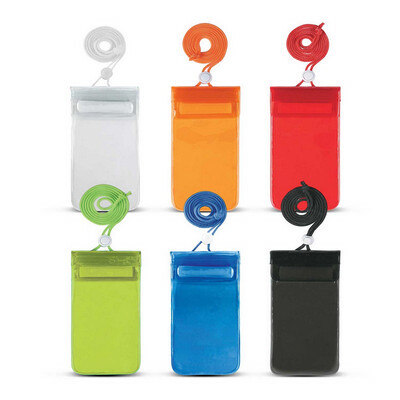 Water proof phone pouch with an adjustable neck cord slider. It has a triple lock zip and will fit most smart phones. The phone can be used while inside the pouch so it is perfect for any water activity or in the outdoors. A lead time of 10-15 working days applies to this product. Colours: Translucent: Clear, Yellow, Orange, Red, Lime Green, Blue, Black. Dimension: W 120mm x H 210mm. Print Description: 63.5mm x 114mm. Print Type: Pad Print. Packing: Bulk. Less than minimum quantities are not available for this item. 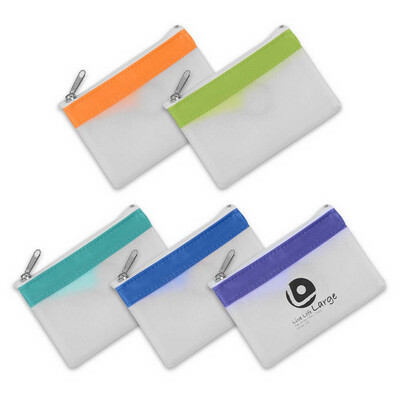 Stylish pouch with a clip and a zippered closure for holding credit cards and money. It is manufactured from an attractive combination of canvas and jute and has the added bonus of a matching colour coordinated key ring attached. A lead time of 10-15 working days applies to this product. Colours: Orange, Pink, Lime Green, Blue. Dimension: W 130mm x H 100mm. Print Description: 63.5mm x 38mm. Print Type: Screen Print. Packing: Bulk. Less than minimum quantities are not available for this item. Vinyl wallet with six compartments for credit cards and money. 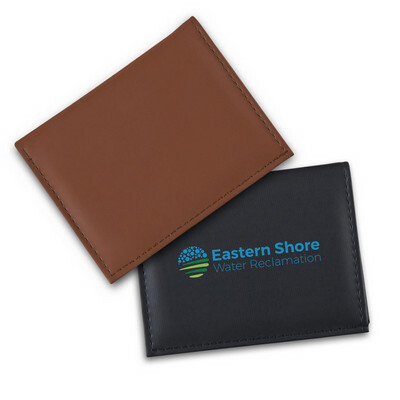 It features an inner metallic foil lining which protects RFID chipped credit cards from electronic theft. A lead time of 10-15 working days applies to this product. Colours: Brown, Black. Dimension: W 110mm x H 82mm. Print Description: 76mm x 51mm. Print Type: Screen Print. Packing: Polybag. Less than minimum quantities are not available for this item. Description: Polished leather beautifully styled with wrist strap. Features: Zipper closure with fold away wrist strap, Provision for all your travel documents, credit cards & travellers cheques, Pen not included. Badge engraves: champagne. Packaging: Wrapped in a white cloth and presented in a folded black tuck box. Packaging Size: 145mm(h) x 255mm(w) x 33mm(d). Colour: Black. Material: Nappa leather with metal badge. Product Size: 130mm(w) x 240mm(h) - Badge: 25mm(w) x 23mm(h). Decoration: Pad Print, Screen Print, Emboss, Engrave, Foil Stamp. Decoration Area: On Badge - Laser: 18mm(w) x 14mm(h) or Pad: 18mm(w) x 10mm(h). Screen - On Front: 70mm(w) x 120mm(h). Other Methods: Contact your decorator for applicability and size. Description: Supplied in a two part gift box. Features: Silver plated money clip. Packaging: Wrapped in tissue paper in a polybag sitting in a black moulded insert and presented in a plain black 2 part gift box Packaging Size: 113mm(h) x 55mm(w) x 20mm(d). Colour: Silver. Material: Metal with nickel plating. Product Size: 25mm(w) x 55mm(h). Decoration: Pad Print, Engrave. Decoration Area: Laser/Pad: 30mm(h) x 20mm(w).